Major Tim Dunne (retired) is a retired military public affairs officer of the Canadian Armed Forces. He has served for 32 years in the regular (full time) force and five years in the reserve (part time) force. He has served on both Canada’s coasts and at National Defence Headquarters. His deployments include the United Nations peacekeeping forces in Egypt, Israel, Croatia and Bosnia Herzegovina, with NATO peace implementation forces in Kosovo, Macedonia and Albania and with NATO’s preventive deployment of Patriot missiles to southern Turkey at the beginning of the Iraq war in 2002. 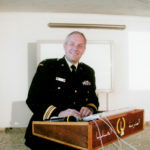 Examples of his project work include the establishment and co-administration of the Swissair 111 international media centre in 1998, the arrival of 2,400 ethnic Albanian Kosovar refugees to Nova Scotia in 1999, the founding of the DND public affairs instructional center in Ottawa and assisting with the establishment of a public-sector communications instructional centre in Skopje, Macedonia for the six Balkan nations. His awards include The National Award of Excellence from the Canadian Public Relations Society (1988), citation from the Privy Council of Canada (1991), the International Association of Business Communicators Silver Leaf and Gold Quill awards (1998), and the Bulgarian Order of Loyal Service (2001). He was appointed the Military Affairs Advisor for the Province of Nova Scotia in 2007, a first in Canada, and retired from the Nova Scotia Public Service in 2009. Currently, he is an adjunct professor of communication studies at Mount Saint Vincent University, the military affairs commentator and columnist for the Chronicle Herald, and the Atlantic Canada correspondent for the FrontLine family of publications. He has been invited to submit analytical articles to The Lawyer’s Daily, Canadian Military Journal and Canadian Defence Review. While serving as the Chief of Media Operations at the southern Europe headquarters for the North Atlantic Treaty Organization in Naples, Italy (2000 to 2004), he conducted public affairs seminars for public sector personnel in the Middle East, northern Africa, and eastern and western Europe, and was the director of communications at NATO press information centres for the Cooperative Key series of air exercises in Romania, Bulgaria and France. Following a brief civil conflict in the Former Yugoslav Republic of Macedonia, he filled the role of NATO Spokesman on an interim basis until a full-time spokesperson was retained. In this capacity, Major Dunne conducted daily news briefings for the international media community in Skopje; conducted numerous interviews; led an international staff of 18 military public affairs and communication and imagery personnel; prepared NATO’s master strategic communication plan for the transfer of responsibility from NATO military peacekeepers to civilian European Union truce observers; and organized an international media opportunity to cover the reintroduction of Macedonian police into the ethnic Albanian communities of the Tetovo Valley. His work in the Balkans has been recognized by senior NATO representatives as fostering and promoting the Balkan Peace Process. He has written two occasional papers for Dalhousie University’s Political Science Department examining the National Shipbuilding Strategy, a guide for media interviewees, several major studies on international terrorism and a handbook on strategic communication planning. He is a former research fellow with Dalhousie University’s Centre for Foreign Policy Studies and is currently research fellow with the Canadian Global Affairs Institute for which he is preparing an analytical paper about Canadian military justice. Military justice: Past Its "Best Before" Date?